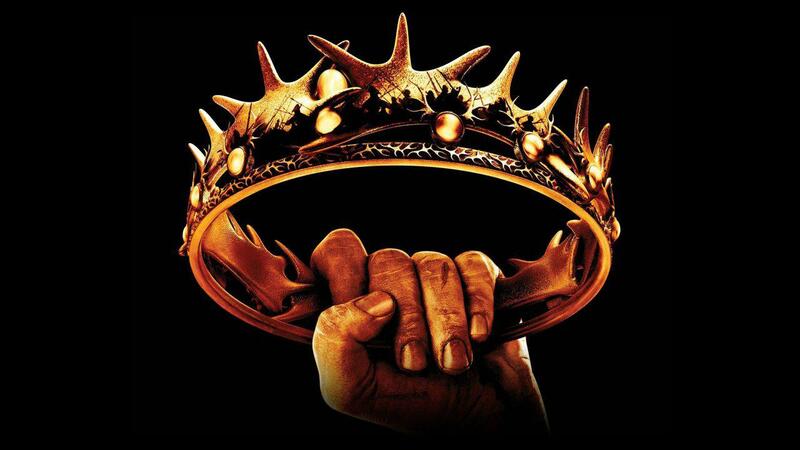 Last week, there was no Game of Thrones, and the world shed a tear. 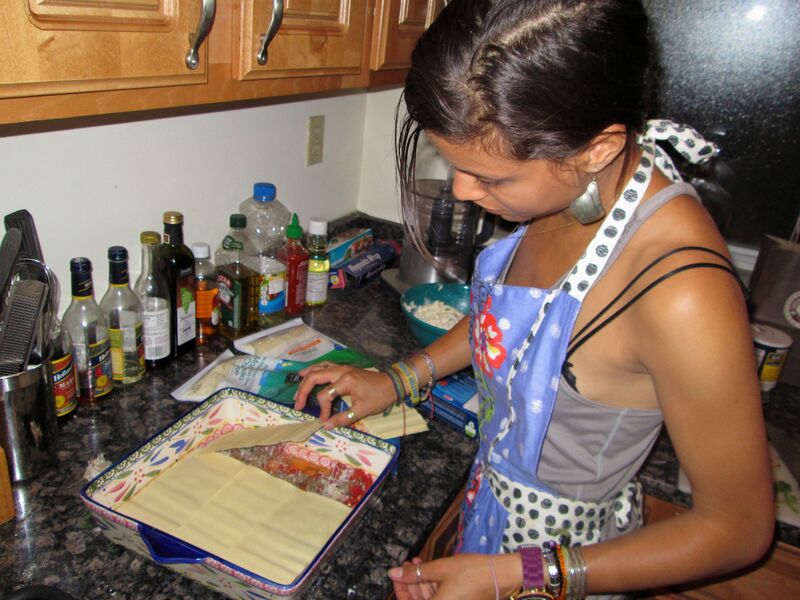 Since no Game of Thrones is still not a good enough reason to starve, I still cooked dinner on Sunday, a crowd–pleasing meal that’s easy and fun to make: Lasagna. While this recipe was inspired by Emeril’s Lasagna Recipe on Food Network, I made it my own, cutting things that I wouldn’t miss to save money (I already went a little over my limit anyways, but I figured it makes for many a leftover so it evens out). I think it turned out better than expected, and the dish had a rustic, fresh taste, and every ingredient could be savored. Make the meat sauce: brown the sausage and beef for about 5 minutes. 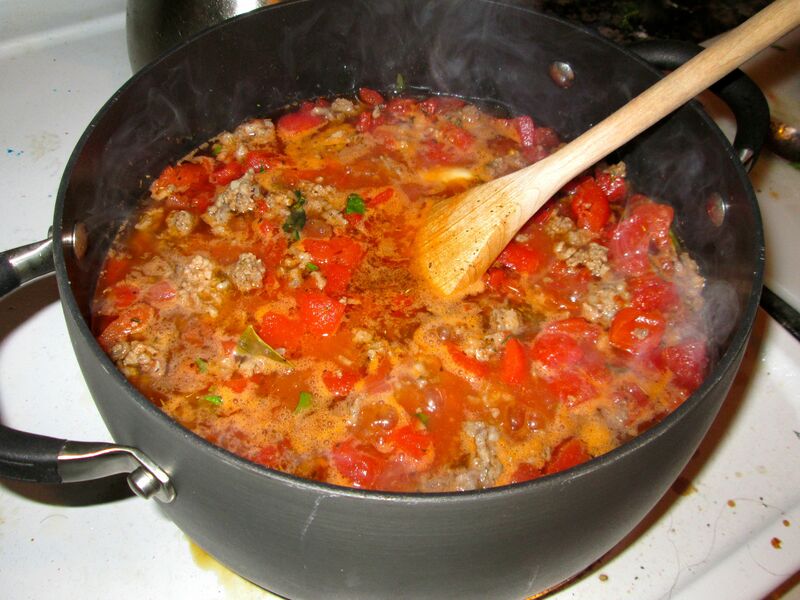 When meat is browned, add tomatoes with their juices, garlic powder, 3 smashed cloves of garlic, shredded fresh basil sugar, salt and pepper to taste. I like my tomato sauce a little sweet because my mom used to put sugar in my spaghetti and meatballs growing up. If you haven’t tried it, you should. Let the meat sauce simmer while you make the ricotta mixture. 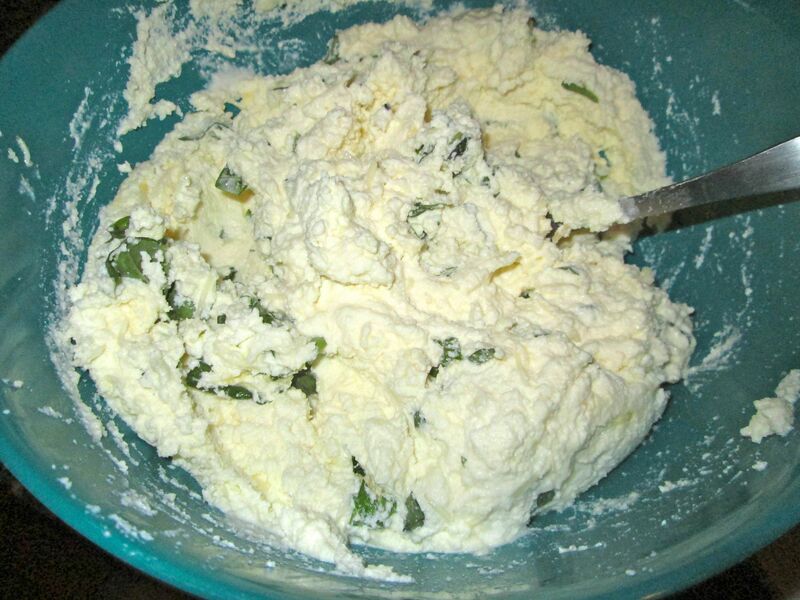 Combine the ricotta cheese, an egg, thinly sliced basil, salt, pepper, and a handful of each of the shredded cheeses, and mix well to combine. Add a splash of milk or in my case, cream, if you have it. 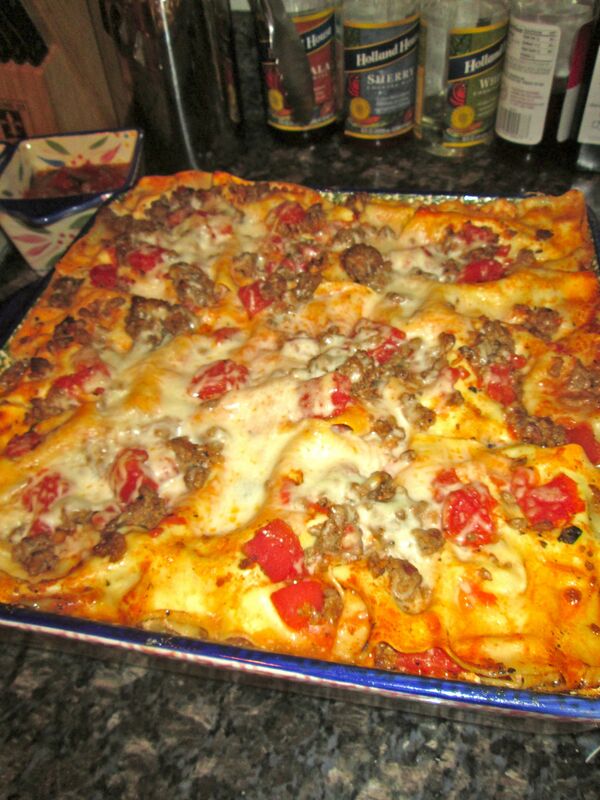 Then all you have to do is assemble: in a large ovensafe pan, put the meat sauce, cheese, and layer of the noodles. 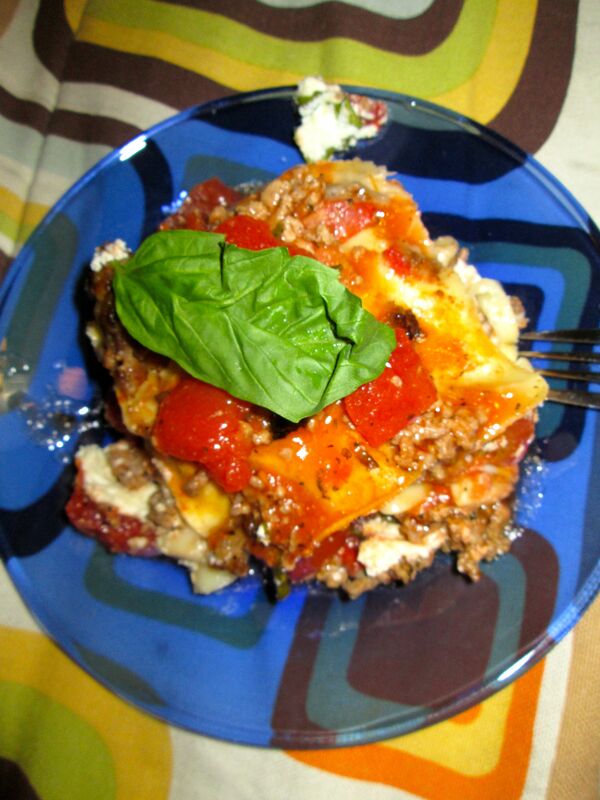 Top with ricotta and meat sauce and continue until you have reached the top of the pan. Then all you do is cover it with foil and pop it in the oven for 45 minutes, then remove the foil and cook another 10 minutes, or til nice and golden. 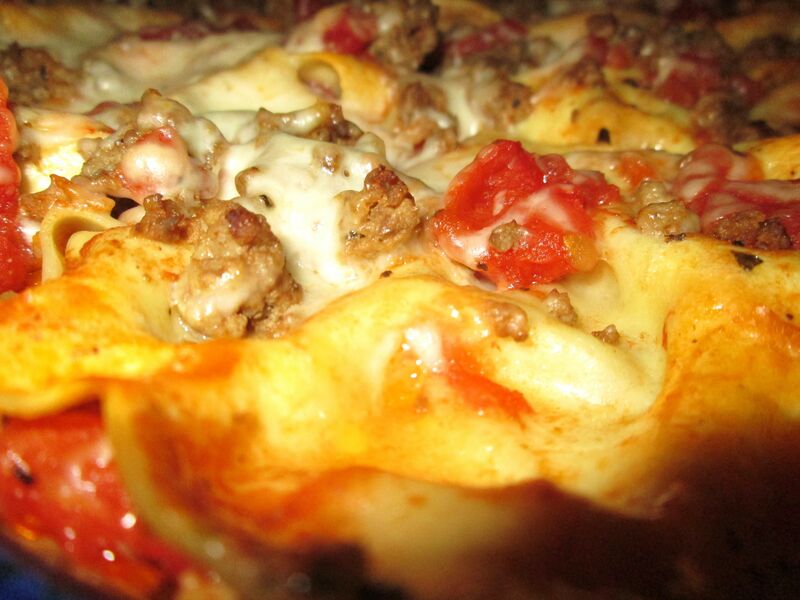 The surface of the planet of lasagnar is gooey with lakes of cheese and mountains of meat. 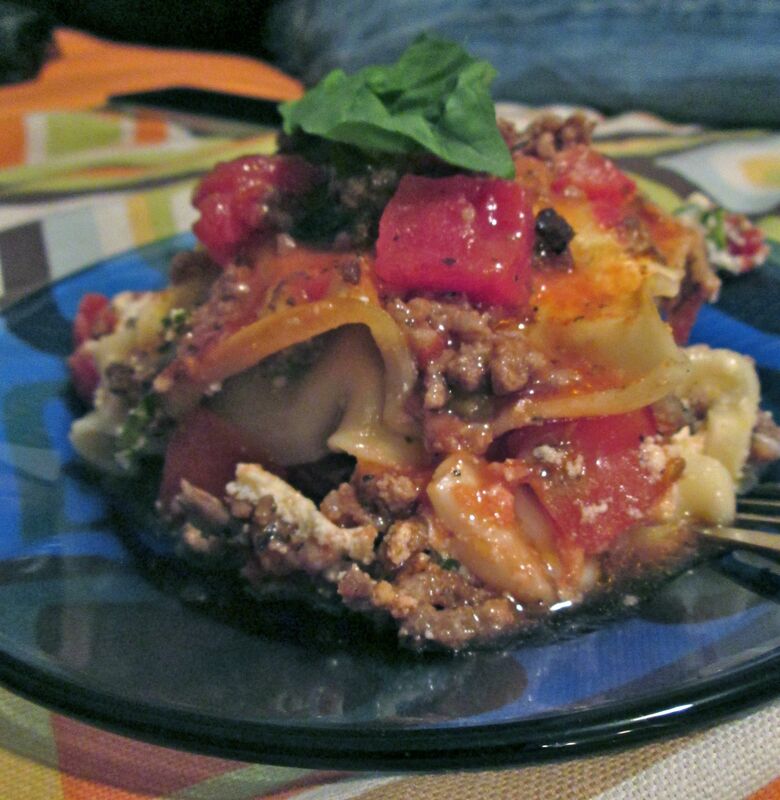 I topped each piece with a basil leaf and some leftover meat sauce, then had a few pieces. The freshness of the tomatoes and the creamyness of the cheese married together perfectly. An easy dinner that you can have for lunch the next day is always a good idea in my book.